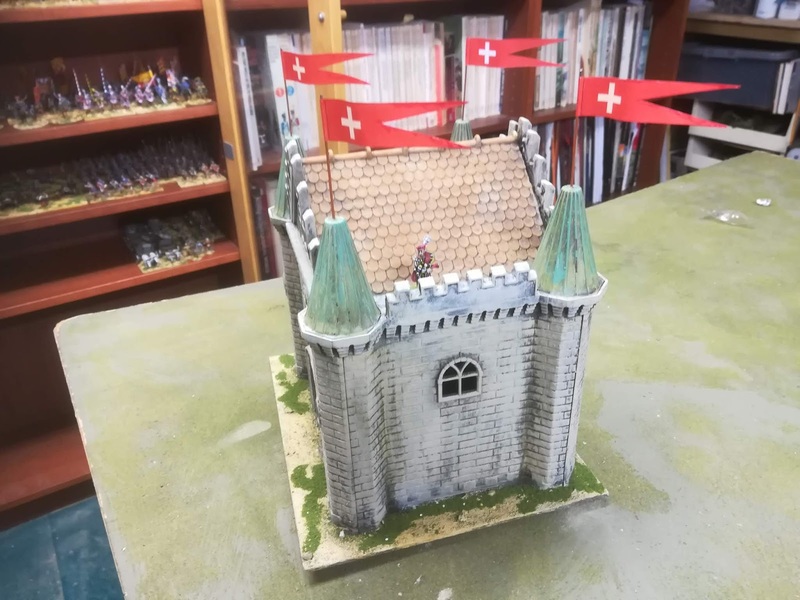 Figures painted,model scenery built and infrequent games. 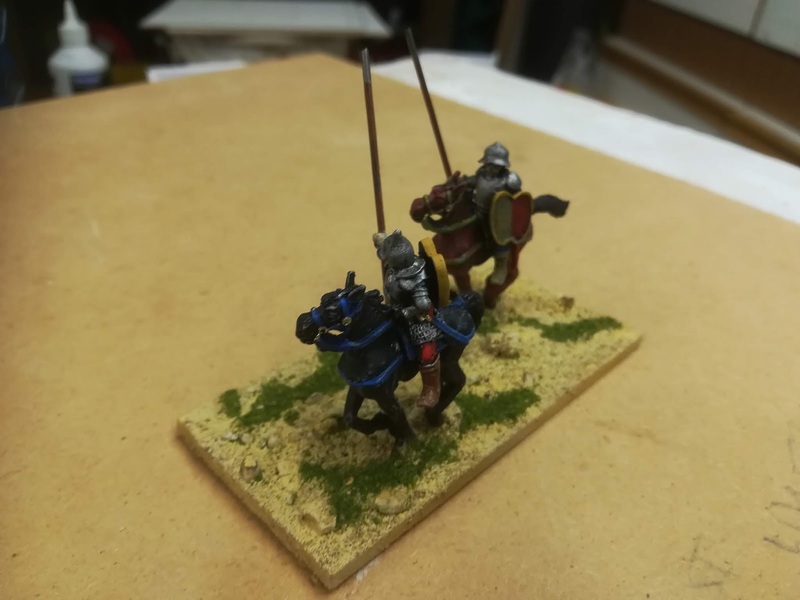 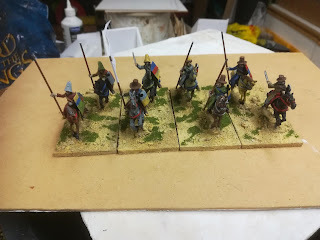 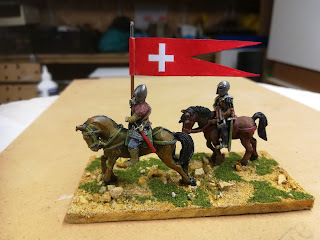 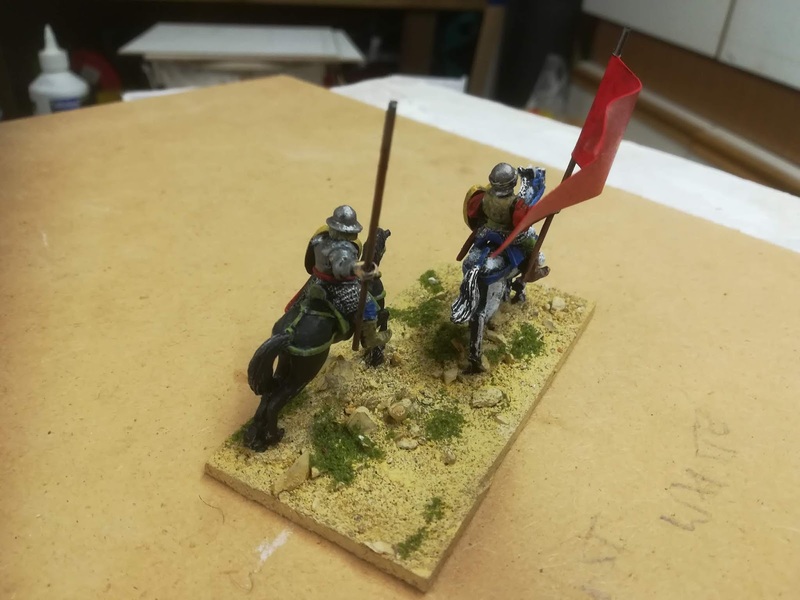 Final light cavalry unit,another old glory unit, you have to stick the hands on before you drill them out! 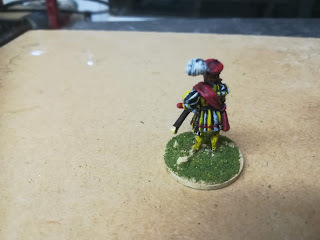 Still nice figures in the end and fun to paint. 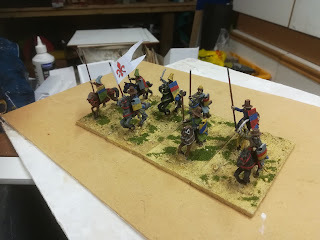 So that's the end eight stradiots in the service of Florence,I've failed to complete Florence in 1500 but its a work in progress! Thanks a lot to Curt and to my fellow minions,it's been great fun! 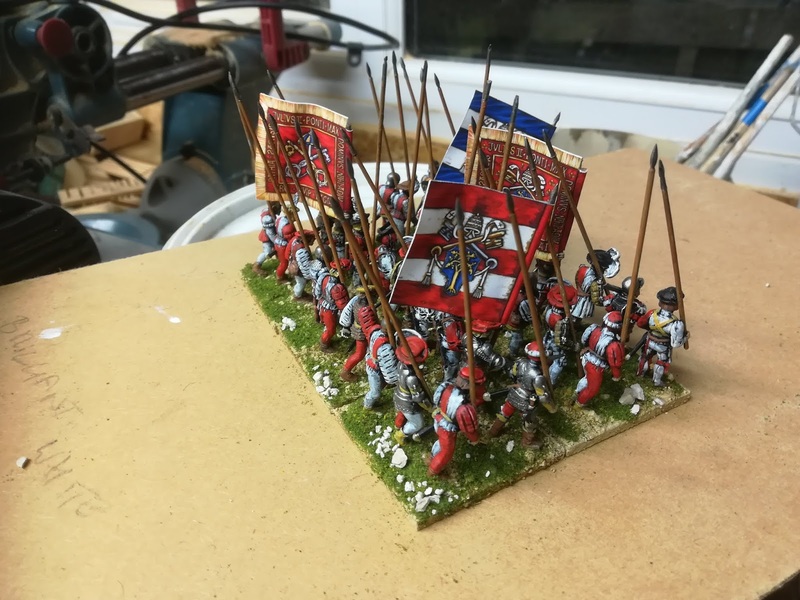 Oh and points 8x10 + flag 1 total 81. 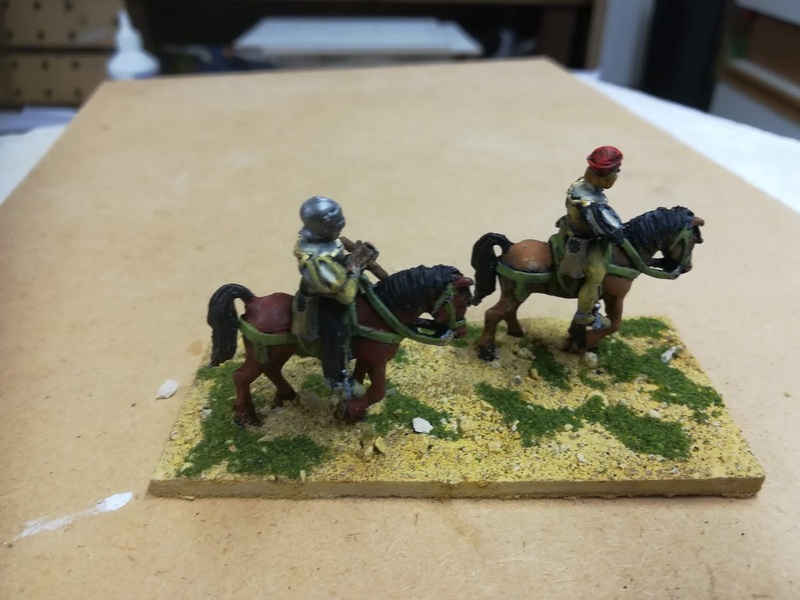 Another unit of light cavalry,this time it is a unit of jinnetts or genitors, Spanish light cavalry armed with javelins and leather shields in the distinctive heart shape. 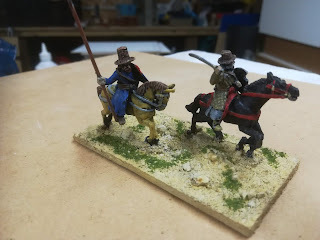 These are old glory figures,I know people comment on perry figures having a lot of flash but I have to say there was an awful lot to do cleaning these chaps up, drilling out hands etc and on this side of the pond they are no longer quite so economical,they're not far off the same price for cavalry. That said I do like them, they are characterful and lively and are a pleasure to paint up. 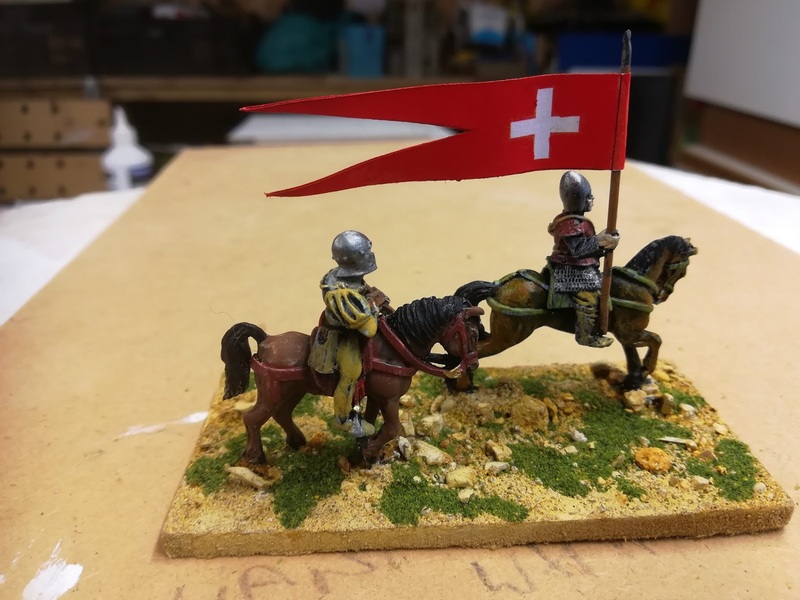 The flag is a medieval Catalan flag which might be slightly anachronistic but I think works well enough and to me close enough is good enough! 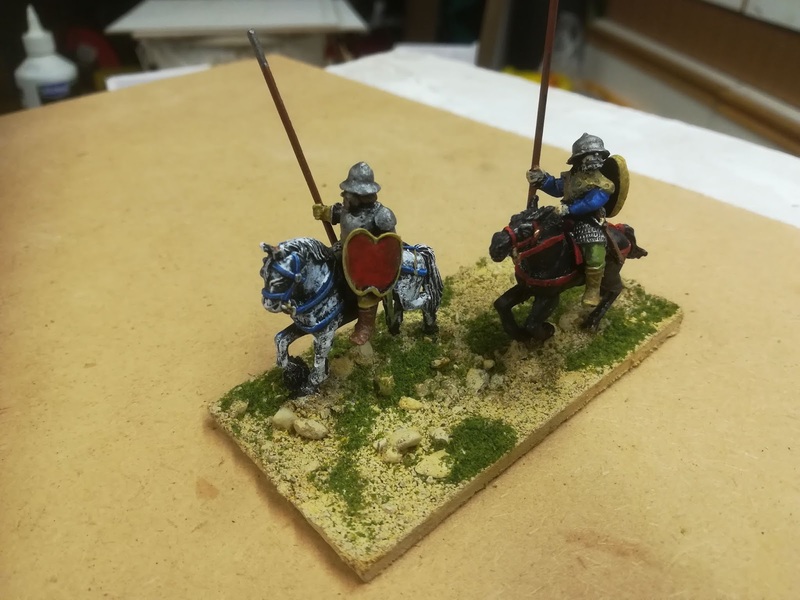 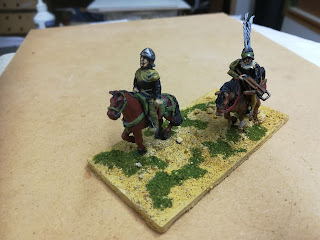 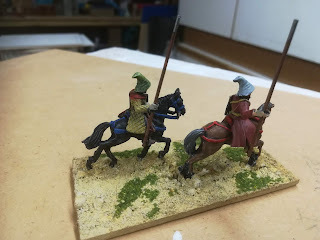 So another light cavalry unit done. Next up my Curtgeld,which isn't an orc but is instead an elderly Maximilian from Warlord games. You'd have to say most of the Rennaisance princes acted in an abominabal manner,absolute power, unbridled ambition,no check to their excess is lets face it not a recepie for a stable human. 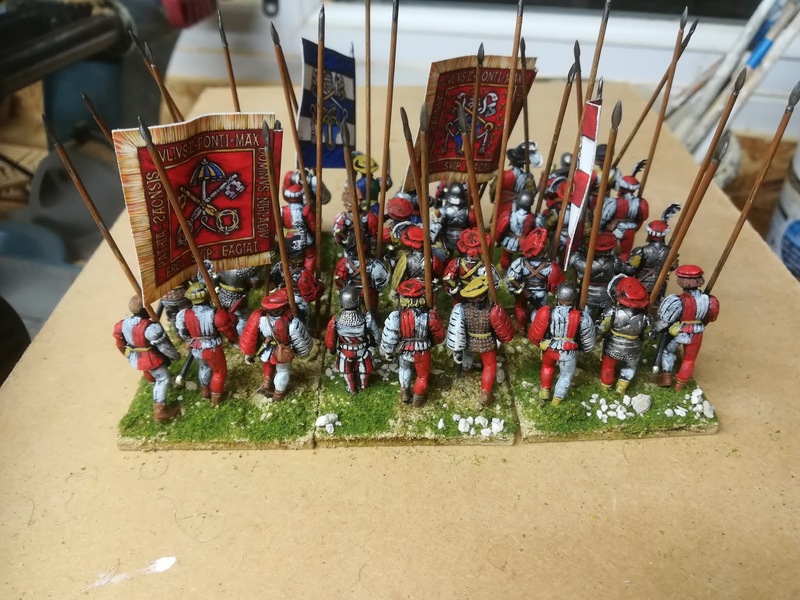 Points wise 8x 28mm mounted figures plus flag, 28mm figure plus Curtgeld, 80+1+5+20, so 106 points. 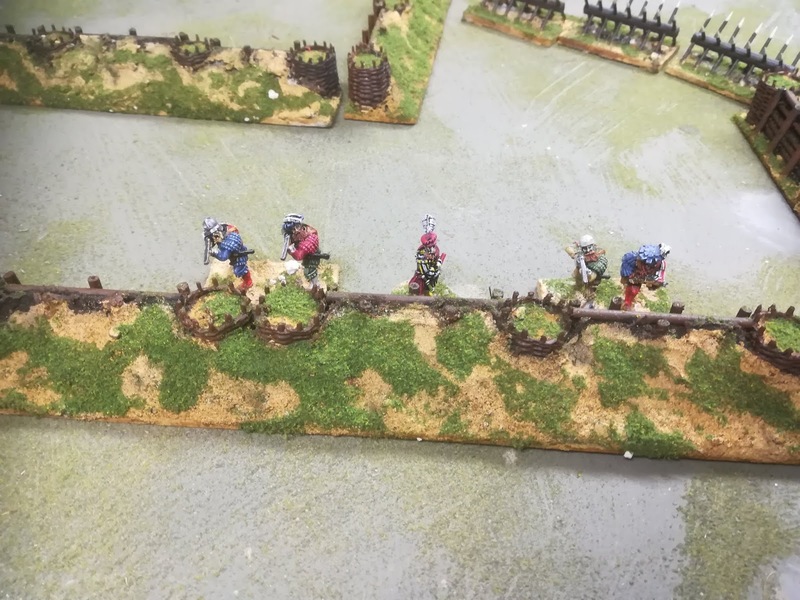 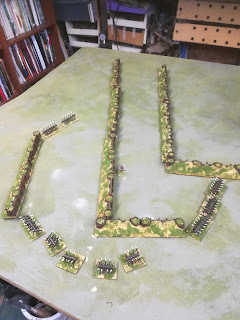 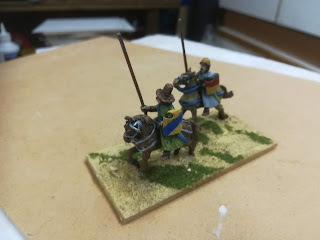 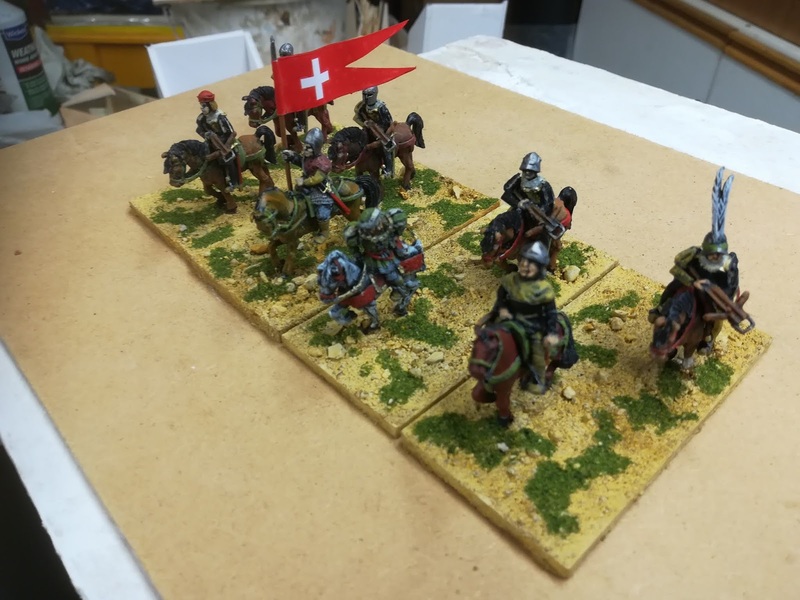 The big aim of this challenge ( apart from a big push on terrain) was to paint up some light cavalry units for the Great Italian Wars, so I have painted command bases, pike blocks, artillery and wagons, none of which I really need (I now have 3'0" of artillery pieces for the Italian wars lined up side by side!). 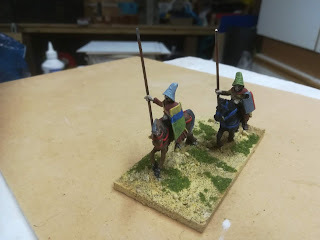 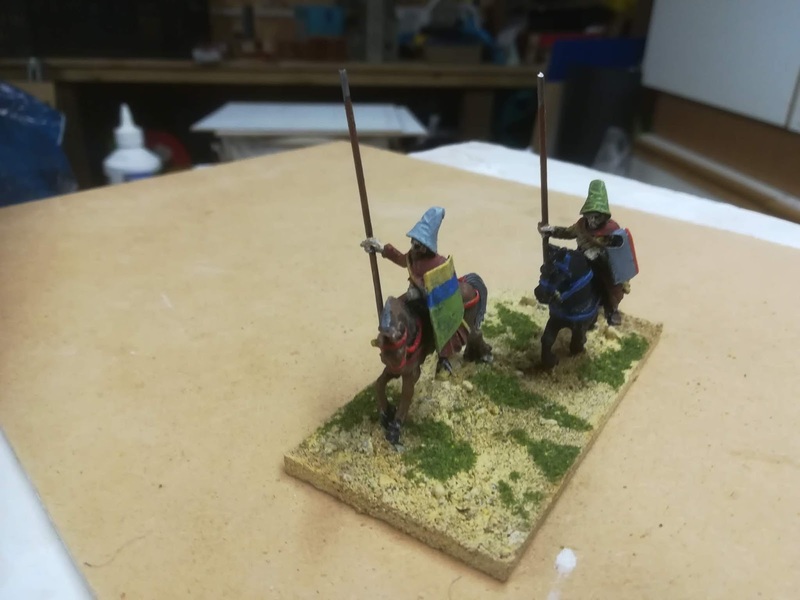 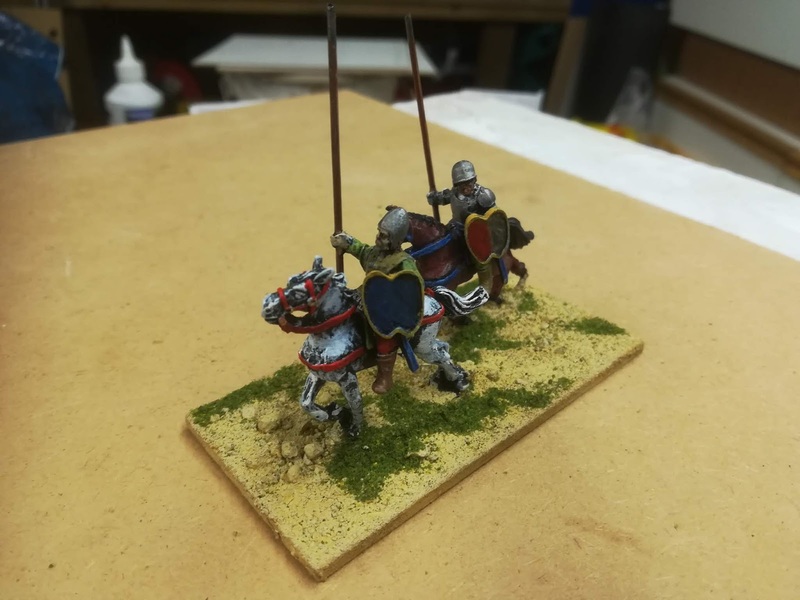 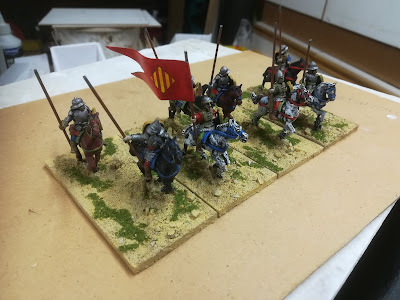 So finally I have a unit of mounted crossbowmen finished! Most of these are Hinchcliffe figures with Perry head swaps, which I think works pretty well, the change of heads help because they are all in the same pose, still I quite like them, which is good as I have two more units primed up! 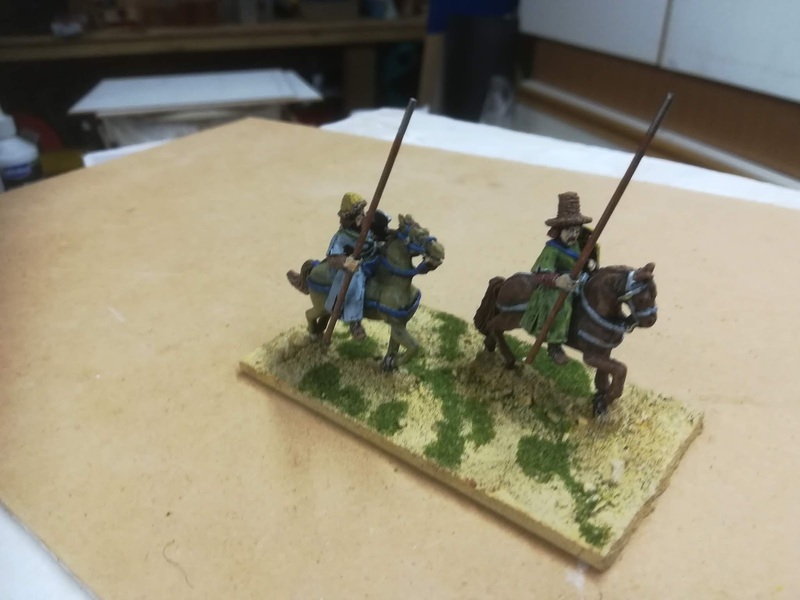 There is also an unknown ebay purchased mounted crossbow man, the flag bearer is an old glory spare and the slightly anachronistic Henry VIII type chap (who I am using as the unit proprietor as it were) is a Hinchcliffe one piece moulding. 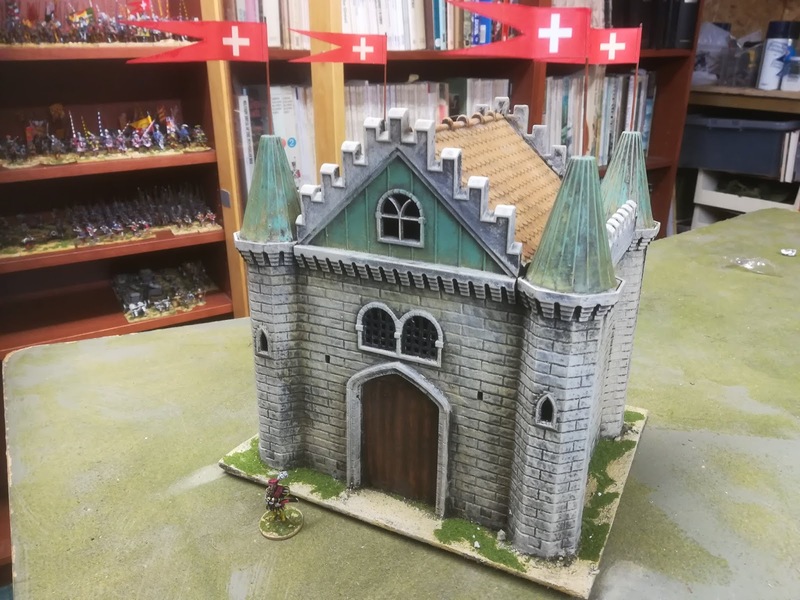 The colour scheme is inspired by Simon Miller's recent Italian army over on his Big Bat Cave blog. 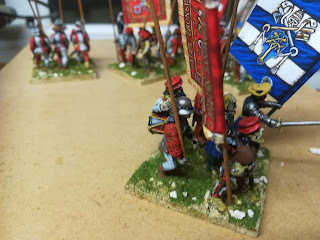 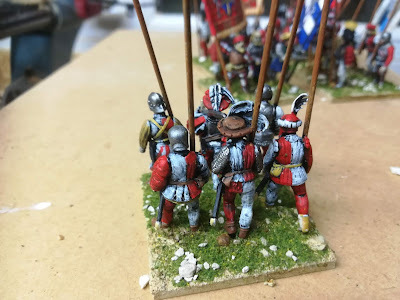 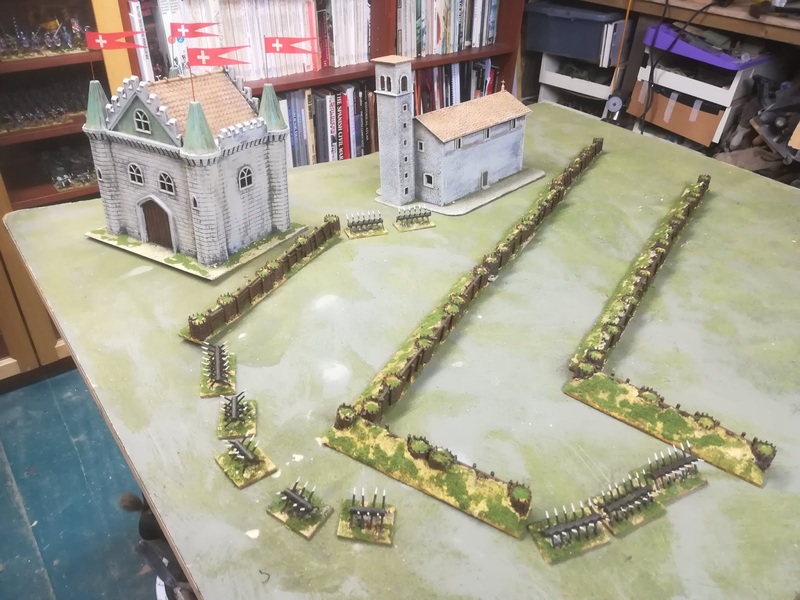 We seem to be going through a phase of warlord Pike and Shotte games (ECW campaign at the moment) and I'd like to have a go with the Italian wars, but we will no doubt go back to To the Strongest as we really enjoyed that ruleset too. 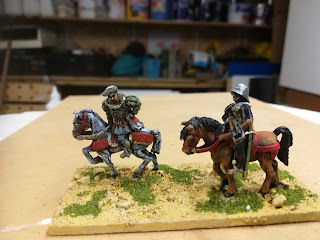 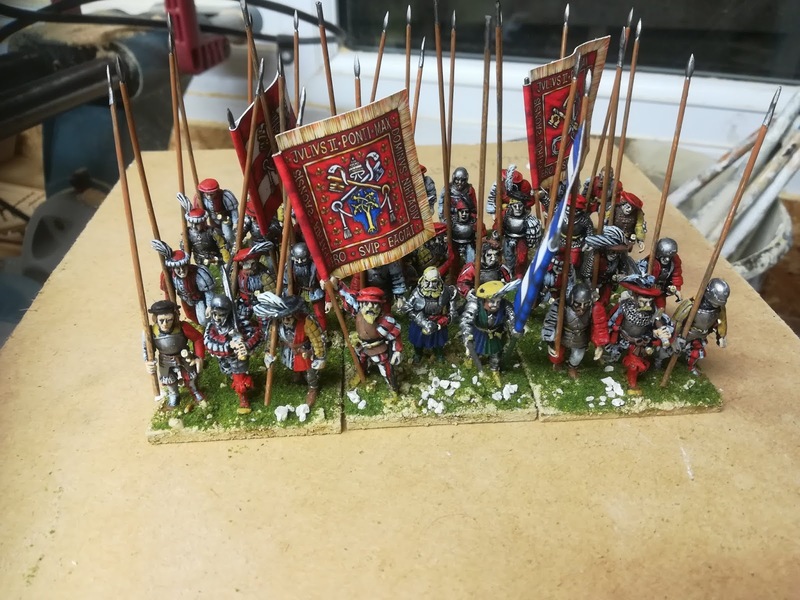 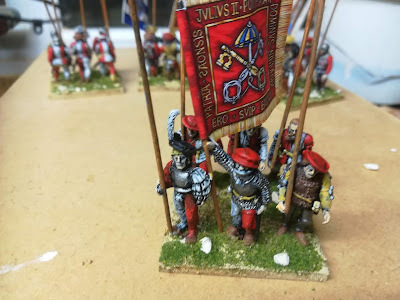 I hope to add some more troops in the last phase of the challenge, this should take me past 500, halfway to my rather optimistic total and so half of what I achieved last time out (who knew painting renaissance figures takes longer than WWII Soviets?! 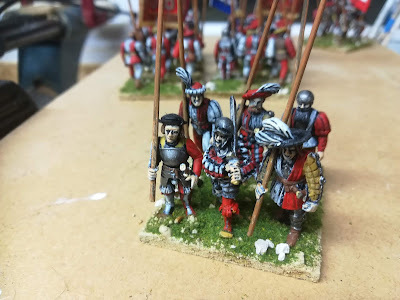 ), still I'm happy with what I have painted with eleven days to go, so eight X 28mm mounted figures is 80 points? 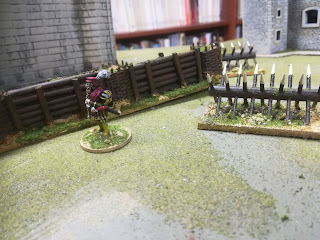 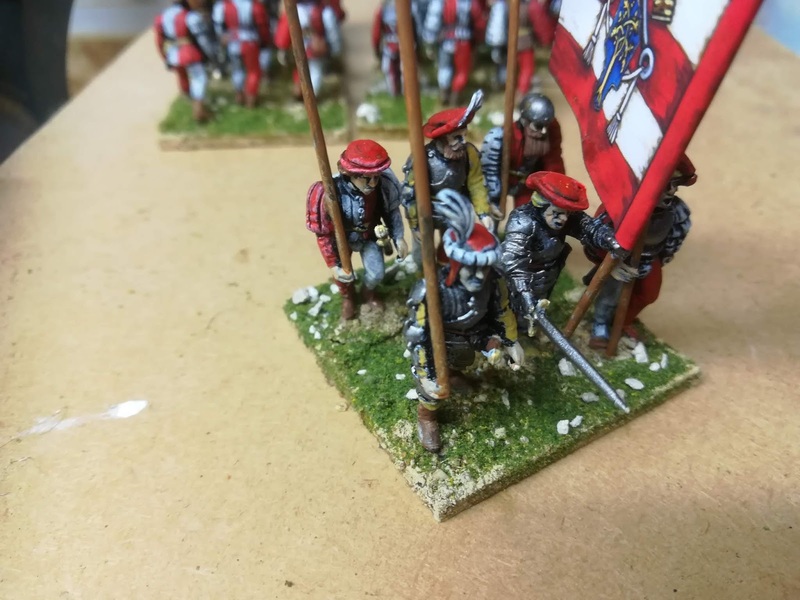 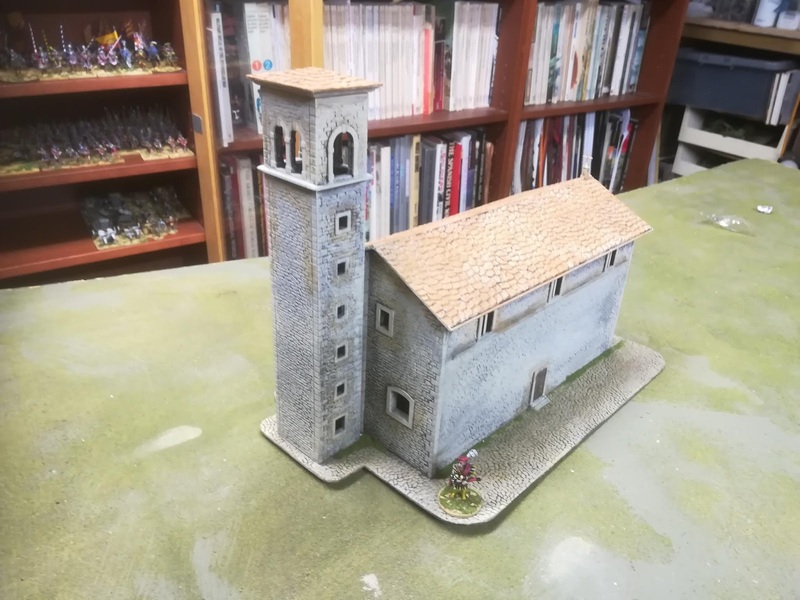 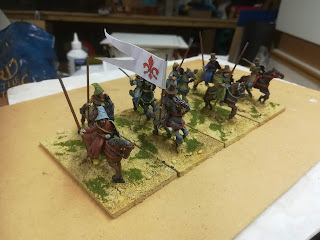 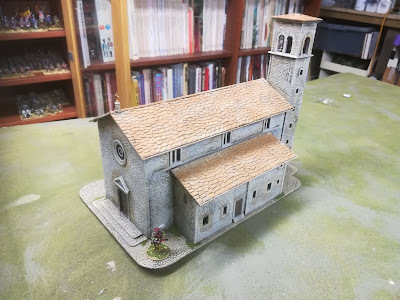 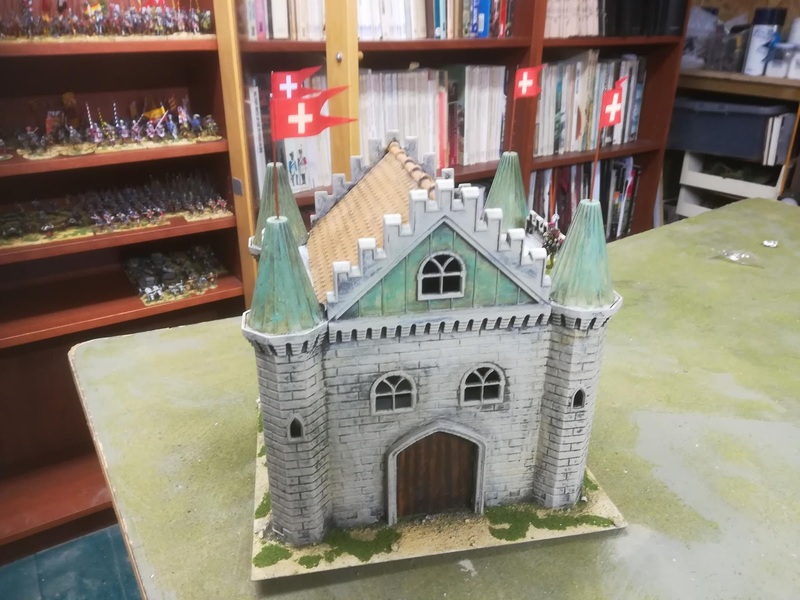 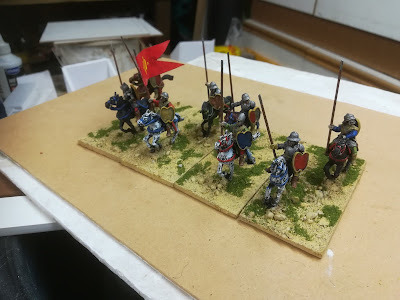 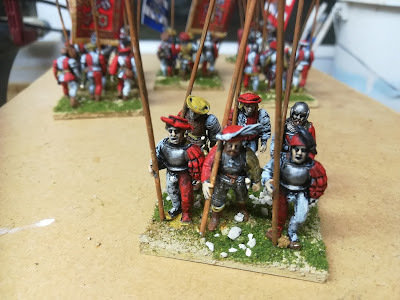 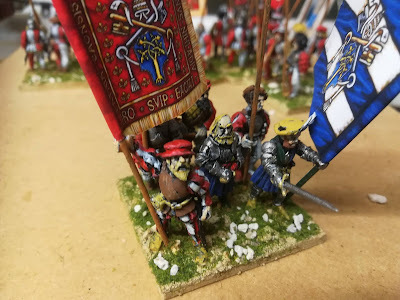 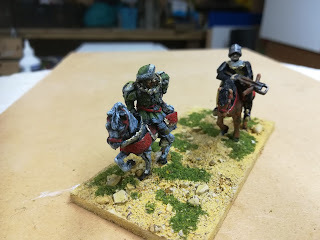 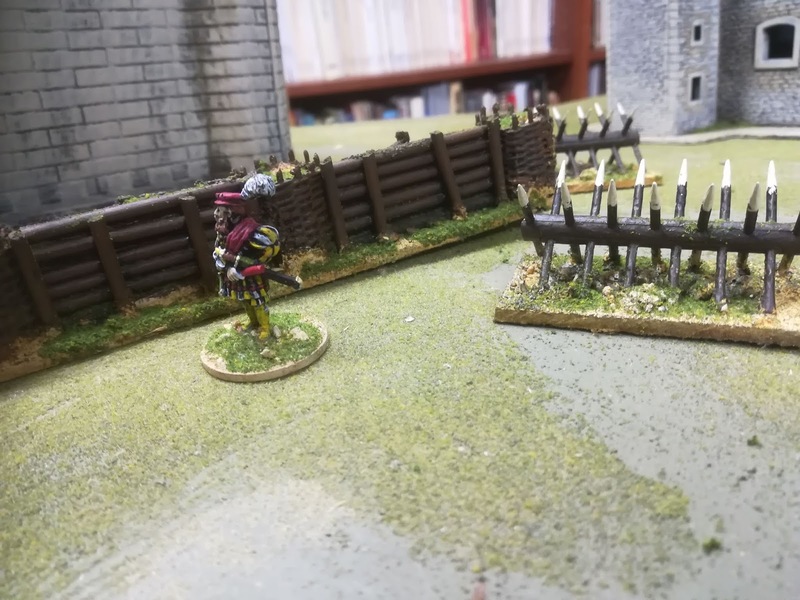 One of the aims I had for this challenge was to paint up a load of terrain, mainly for my Italian wars, so this is the first post to reflect that. First up is the Italeri/Warlord plastic church a nice chunky piece originally marketed as a 20mm model by Italeri it's now sold as being for 28mm figures by warlord, you can see the side doors are small but overall it does a job and works for me for the period,I like the tower and the tiled roof. It was bought in warlords pre Christmas sale and given to me by my daughter who also helped build it, it's funny she was quite happy to help build the model but was mortified people would know she enjoyed watching lord of the rings while we did it! It's also a pretty good match for the church in Kelly's Heroes which as it was shot in what is now Croatia makes sense. 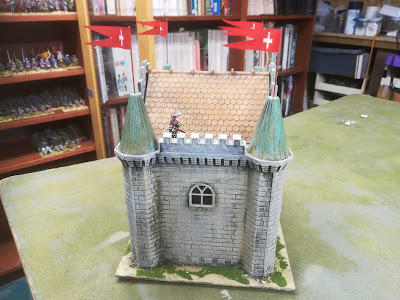 Next up is a tower I'm intending to use as the Castello Mirabello at the battle of Pavia, flying French flags before it's stormed by Imperial troops. The Bradford City landsknecht officer is for scale, it's a toy castle that I have lightly tarted up, Im rather happy at the way the roof has come out and the verdigris on the towers, it's more for 54mm figures. Next is field fortifications which are essential in the Italian wars for the Spanish to hide behind when fighting the French! The earthworks are made from rendra gambions (as are the cheveux de fris) bamboo skewers, cardboard and tile adhesive, following the instructions on Olicannalads blog. So that's them all together, the mix of scales works alright I think. 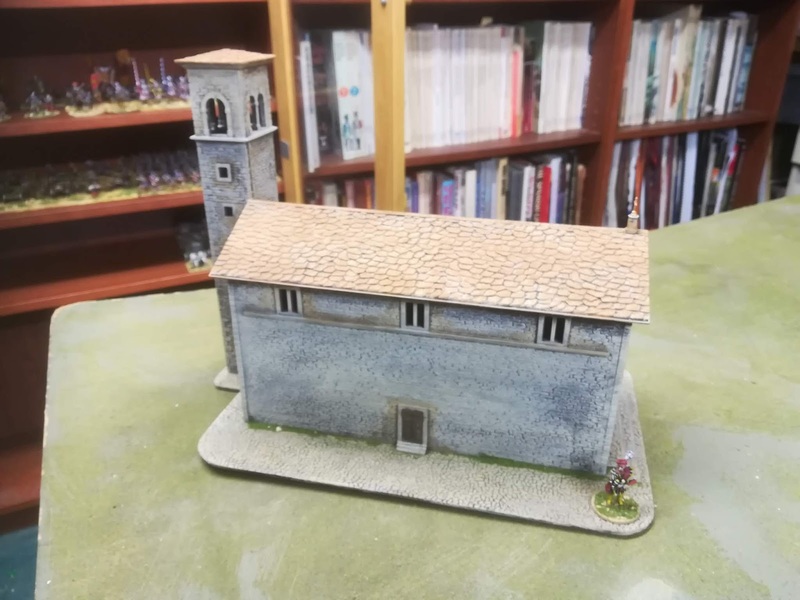 The church is just under two 6"x 6"cubes, the Castello is over two 6"X 6" and the earthworks is about one 6"x 6" cube, so five cubes I think? 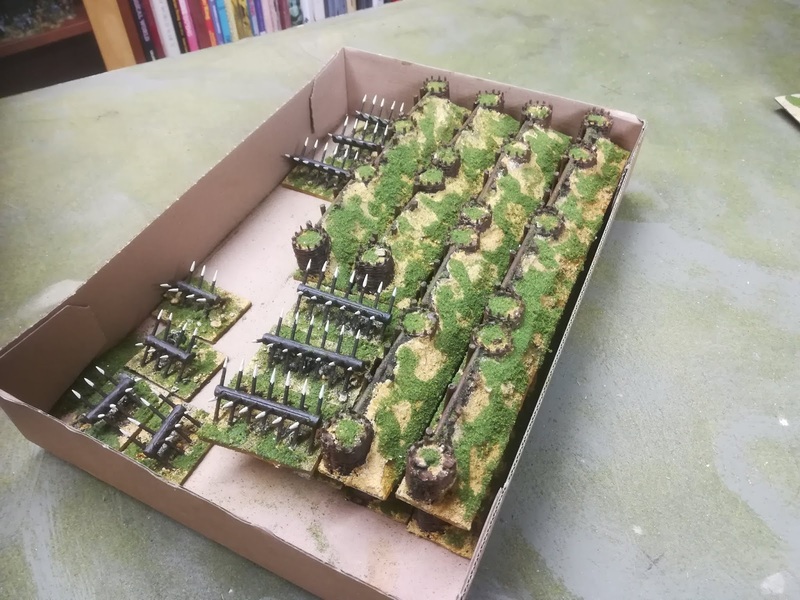 More terrain further down the line. 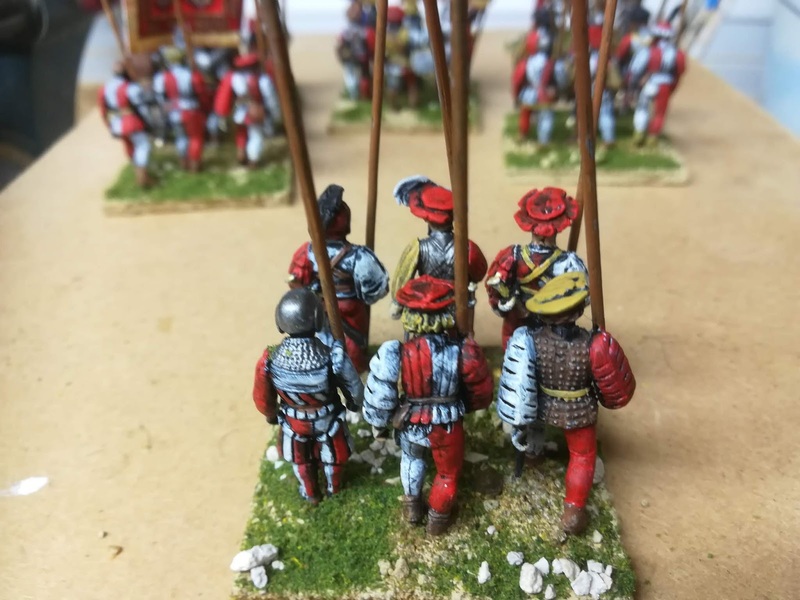 Here is a unit of Romagnol pike, the best native pike of the Italian wars. They were prominent in the armies of both the Papacy and Venice, I've shown them with Papal flags but I can easily swap those out for Venetian if needed. 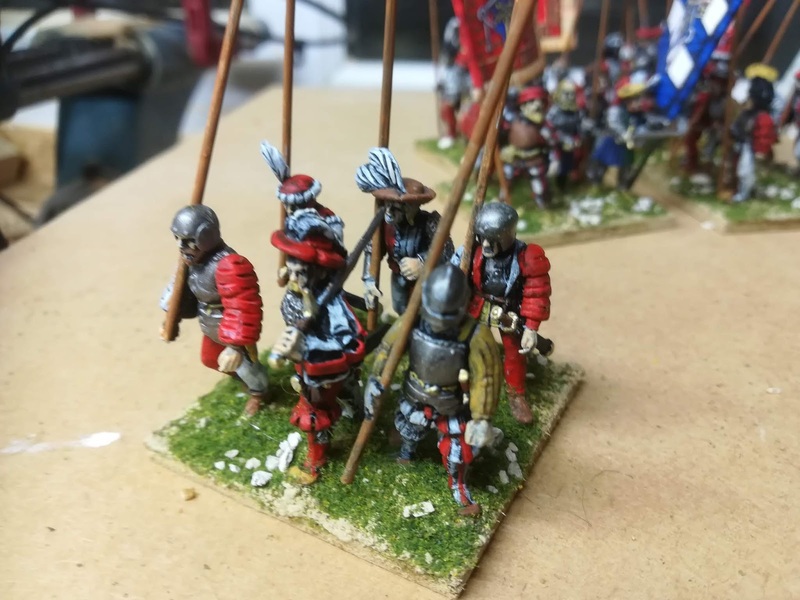 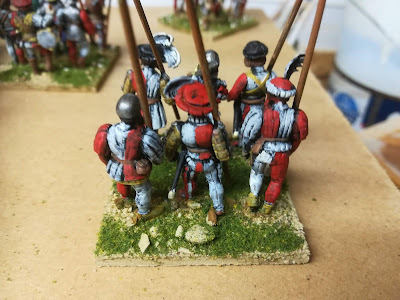 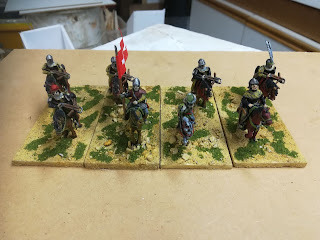 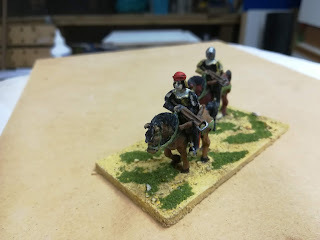 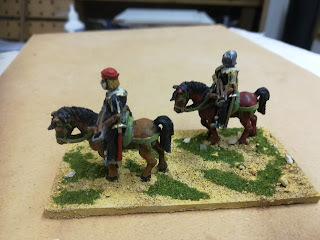 These are a mix of mainly Perry plastic mercenaries and the Pro Gloria/Warlord plastics,I wasn't that keen on the plastic landsknechts to start with but I really like the kit now, its given me a nice mix for an early 16th century unit. 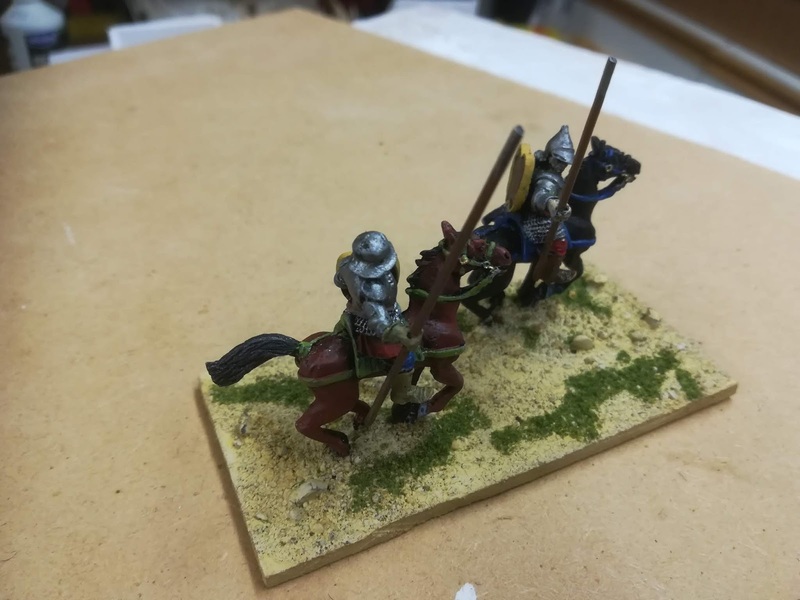 There are also some Foundry landsknechts and conquistadors mixed into the unit. There's also a few Artizan dopplesoldiers. They've been great fun to paint (in the colours of my football team, Arsenal) and even though they're late, they were meant for the mercenary bonus round, I'm glad to have them. 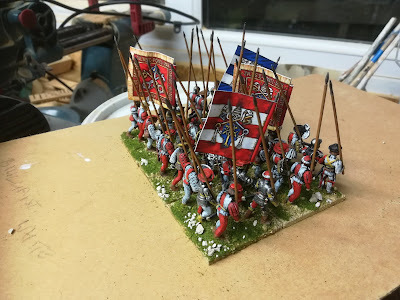 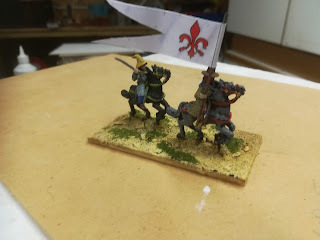 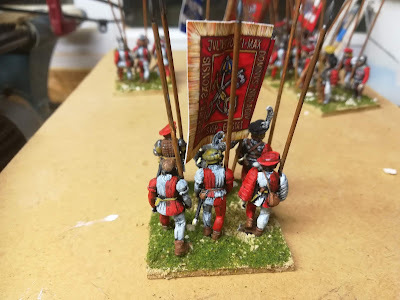 Thirty six 28mm figures and four flags and yes looking at the photos I realise I need to touch up the edges of the flags! The flags are from the excellent Pete's flags. 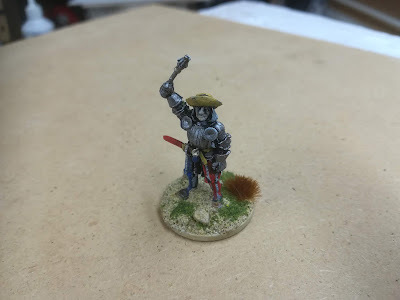 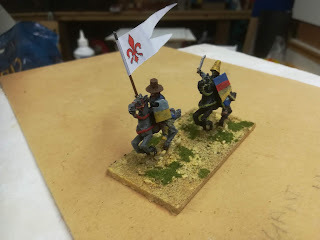 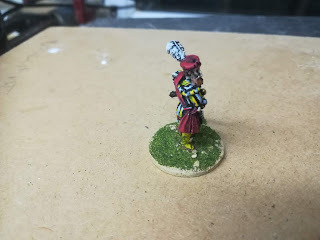 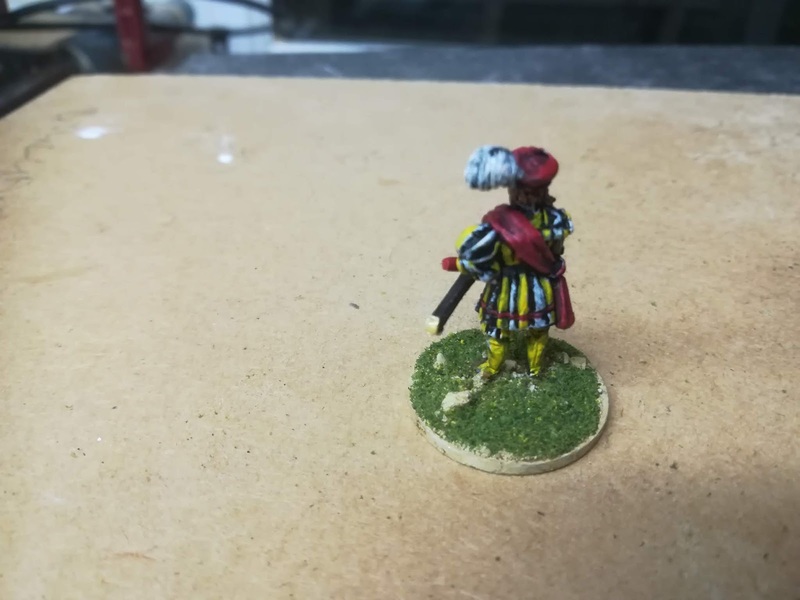 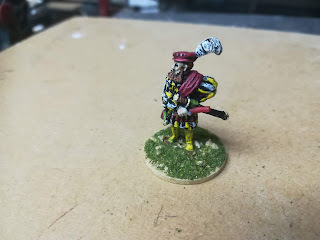 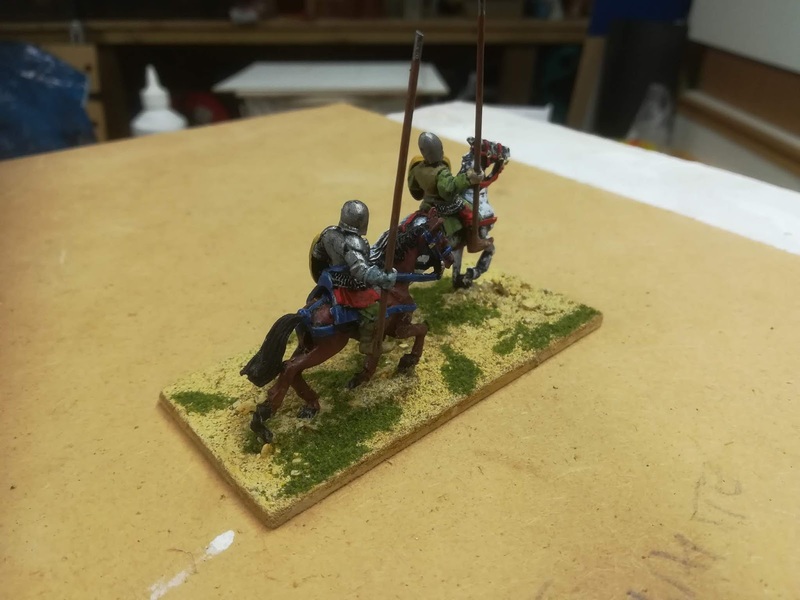 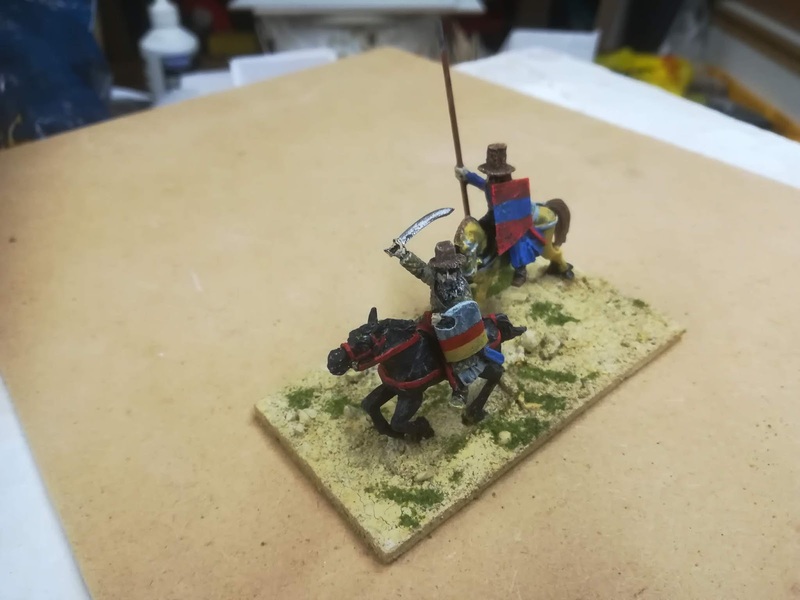 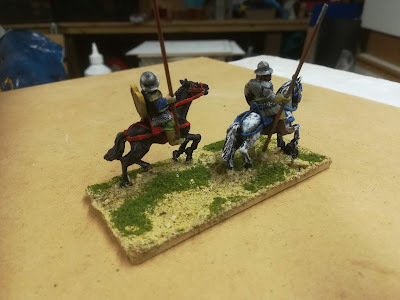 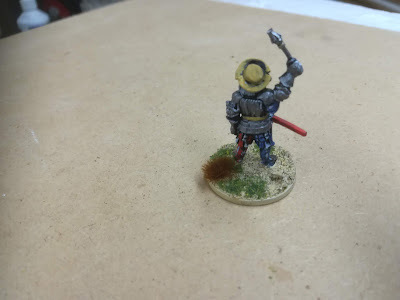 I have also painted a landsknecht commander on a single base. He's a warlord games metal command figure,it was fun just painting one figure!